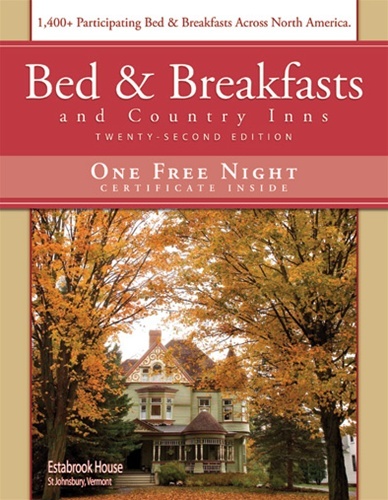 SOLD OUT - Bed & Breakfasts and Country Inns, 22nd Ed. What would life be like if you took more frequent getaways - the kind of little trip that renews your sense of joy and wonder? What if you planned a trip for every anniversary and birthday instead of just dutifully going to a restaurant? Each copy contains a certificate, valid at any bed and breakfast listed in the guide, that can be redeemed for a free-night’s stay with purchase of the first night* - an offer that can help you save hundreds of dollars on your next trip. Here’s how to start planning adventures and meet your travel goals. Purchase your copy of Bed & Breakfast and Country Inns today. Choose from the more than 1,400 B&Bs and Country Inns who participate in the program. Go to iLoveInns.com/freenight and search additional properties added since publication. Make travel goals – you could save hundreds of dollars at many of the participating inns. Set your dates and insert a calendar into your new book! So many of you have shared your wonderful B&B experiences with us. There is nothing so rewarding to us at American Historic Inns than to hear how much joy our books make possible! And to give you a free night worth an average of $142 — really makes us feel good! * Check with individual inns for blackout dates and other restrictions. My wife and I have been taking three-day roadtrips for 12 years. We've stayed at over 60 B&Bs within a four-hour radius of our home. Because we always book an inn that accepts the free-night coupon, we always pay for only one night instead of two. Whenever I can, I find an inn that's 100+ years old, has five or fewer guest rooms, and provides a gourmet breakfast. The American Historic Inns directory offers an incredible deal! For at least three years now, I have given my mother one of these certificates for a free night at a bed and breakfast. But, she is not getting just a coupon.....what she receives is the knowledge that sometime in the coming year, she and I will take a special trip together, just the two of us, and we will travel somewhere to a lovely bed and breakfast. She does not want gifts, just time with those she loves. This is becoming a tradition and an event full of special memories.